If you pay attention to the picture, I think Alex is actually relieved that the object of Cynthia’s affection happens to be Kingston and not her. By the way, I am not advising pet parents not to hug their dogs. Au contraire, show your dog how much you love him, but please do it nicely, that’s all. This entry was posted in Dogs, Humor, Walking and tagged Breed, dominance, fearful. Bookmark the permalink. I love to write about things I go through with Alex, my dog, and the dogs that stay with me. I also enjoy other pet parent’s stories and suggestions. Thanks for stopping by my blog! My (scientist) sweetie did an experiment with our anxious dog. He decided to pick him up every time he stood on his back feet and raised his paws without leaning them on my sweetie’s leg (he didn’t enjoy being pawed at). He was not sure if this would be reinforcing or extinguishing, but it turned out Crackers loves to be picked up and asks for it all the time now. (We were unsure because he often grips so hard when off the ground we though he may find it scary.) When he started to feel like a personal puppy elevator we decided we’d have to put the behavior on cue–a little too successful =-) Anyway, it’s all about finding out what the dog wants, and one way to do that is to train them to do something to initiate the interaction. I’ve seen this done very successfully with hugs with a blind blue heeler with terrible hip troubles, and she still liked to hug when it was on her terms and she got to start it by putting her paws on her person’s shoulders–but if she was feeling tired or hurting she could decline and that was still OK.
I’ve helped train sharks for underwater hugs–I think they ended up enjoying it more than most dogs I see do! Every dog is different. Some do enjoy being hugged, while others will do a disappering act when they see the pet parent ready to hug them. Do you find that many small dogs enjoy being picked up, or just are tolerating it? You’re so right about hugs! The trainer/rescue volunteer who was instrumental in helping our dogs join our pack doesn’t hug her dogs at all. I do hug ours, but I’ve taught them the phrase ‘May I have a hug?’ They know what it means and indicate with body language whether a hug is welcome at that point or not, and I always honor their response. Great job. Yes, never go up to any dog, if your own, and hug him. That is just asking for trouble. I do hug my Alex, but I do not squeeze her because she is a skinny girl and I want her to welcome my hugs and not run away from me like she does sometimes with Cynthia. 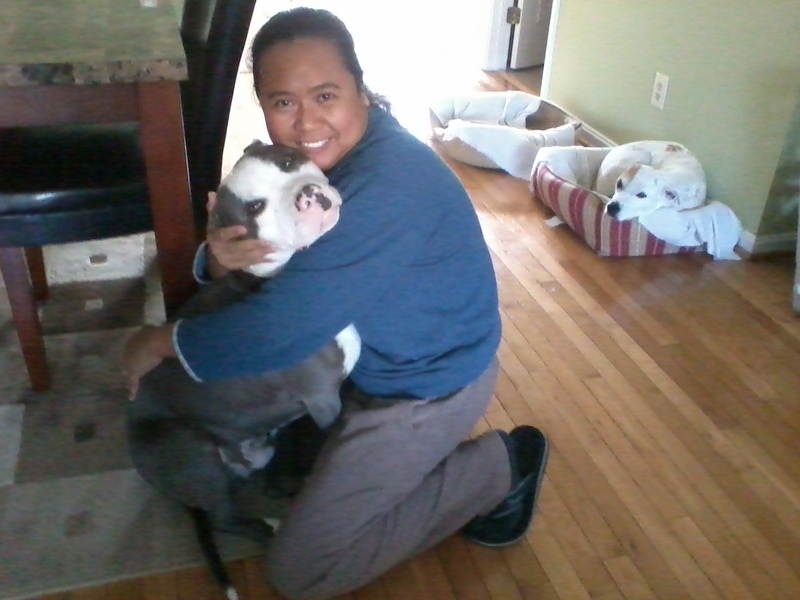 Cynthia is a big hugger and squeezer. I must say Simba is fortunate enough that not much of people try to hug him. Please do not get me wrong I am not trying to make Simba look bad, it is just I do not trust people here enough. Most of them do not even know how to meet a dog. Being a dog lover doesn’t mean that you know how to greet dogs. And sometimes people do make mistakes with end up being bitten and I would rather look rude than being deemed as a human of dangerous dog (which simba is absolutely not). People are need to be educated about dog psychology. Thank you for this article is will help people to understand dogs better. You are so right. I’ve met plenty of pet parents that do not know how to approach a dog and the result is a disaster. When I go for walks and I get asked by children if they can pet my dogs, my answer is always, “no sweetie. We are out for a walk, but thanks for asking”. And I keep walking. Yes, just like you, I prefer that they think that I am rude rather than somebody getting hurt.